I’m on a hot streak of fantastic science-fiction novels, and I wanted to share them with you. The first is from Brandon Sanderson, who I think might be the best speculative fiction writer working today. And man does he work…every year he has a new book, sometimes more than one. His most recent novel is Skyward, which for some reason I thought was about a girl and her dragon. Not so much–it’s about a girl and her spaceship. Apparently Sanderson tried to write the girl-and-dragon story years ago, but it wasn’t working, so he put it away for a while and returned to it within the science fiction genre instead of fantasy. I don’t want to spoil anything, but if you enjoy Sanderson, science fiction, and some of the best-written characters in any genre, I highly recommend Skyward. The next two books come in a pair. They take place in an alternate history when, in the 1950s, a massive meteor strikes the Chesapeake Bay, devastating the east coast of the US and having a long-term impact on the entire world. As a result, mankind creates and accelerates an international space program as they look for alternatives to Earth. I love reading speculative fiction that feels like nonfiction (like The Martian), and both The Calculating Stars and The Fated Sky are amazing examples of this genre. They both include some fascinating social dynamics, as the story follows a female pilot in a time when even the most educated, qualified women were treated like second-class citizens. Like Skyward, the characters are really well written–they’re nuanced, 3-dimensional, and flawed, yet they surprise you in ways that are completely believable. I will gladly continue to read other novels by Mary Robinette Kowal. Have you read either of these books? What did you think? What’s the best science fiction book you’ve read this year? This entry was posted on Tuesday, November 27th, 2018 at 8:17 pm	and is filed under books and tagged with books. You can follow any responses to this entry through the RSS 2.0 feed. 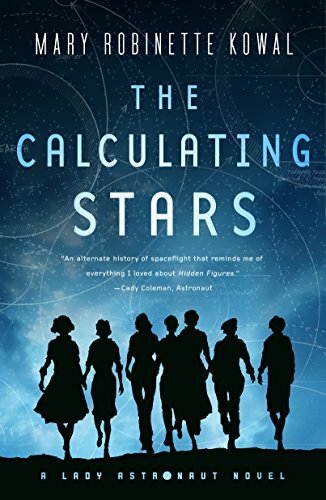 The Calculating Stars and it’s sequel were my favorite science fiction novels of the last year. That’s awesome! I’m glad you enjoyed them. I’ve read more fantasy than Sci-fi this year. But I did enjoy Perdido Street Station by China Mieville. It’s a marvelous steampunk world with many sentient species, science-based magic, and a whole lot of general weirdness, including steam-powered, mechanical AI. Thanks Adam! My favorite Mieville book is The Scar.